If you are thinking about outsourcing the building of small niche sites or adding extra sites to your private blog network, then STOP. Looking to build yourself a niche website, but don’t know where to start? If you are thinking about paying a designer or web development company a lot of money to build you a website, then STOP. This is something that with a few hours and a very modest budget you can build yourself your perfect site, and you have the added benefit that you will learn some new skills, so you aren’t reliant on paying through the nose every time you want to change something. This free WordPress guide will clearly show you exactly what steps you need to take. I will personally show you step-by-step how you can do this yourself, as I will actually build a new site and document the entire process with screenshots and every single little detail. By investing just $51 of your own money, you can have a premium domain – complete with with over 3,600 words of content, up and running within 6 hours – and the best thing about it is you don’t actually have to do much of the boring work yourself. I’m going to start a timer, and show you in real time how long this stuff actually takes. You’ll be surprised that with a little process streamlining you can churn through this list quite nicely, not forgetting to have plenty of tea breaks. I’m assuming you have already decided a niche and know the list of keywords that you are hoping to target. If you haven’t done that already, then you need to read this tutorial first. This isn’t a niche research tutorial, so I’m not going to go into any detail how I chose these keywords. These have just been picked fairly quickly and all have between 700-1500 exact searches a month. The competition on these keywords didn’t look to be very difficult either, so there is a chance we could rank for those keywords with minimal back-links and some good on page SEO. In this tutorial, I won’t be going into the process of choosing a niche and picking keywords as I want to just use this site as an example to show you the process involved in getting your website up and running with targeted content. I will be writing an in depth tutorial on picking your niche and keyword research later on. If you would like to be informed when that article goes live and when we publish other awesome tutorials – simply enter your name and email address in the box below. We’ll be using a superb outsourced service to get our content, called iWriter. It uses crowd-sourcing to enable you get get articles written quickly and in parallel. 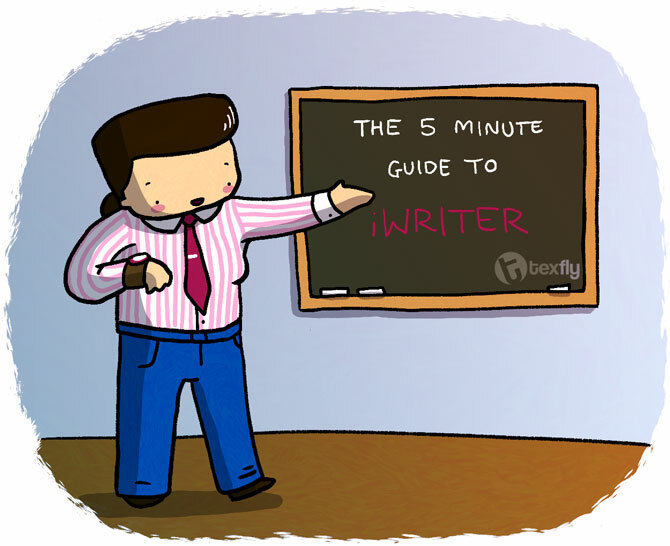 Normally with one writer if you requested 10 articles it would take a while because he has to process them all sequentially, but if you had ten writers available, you could get them all done at the same time. We are going to purchase 6 articles for this site, two 300 word articles, two 500 word articles and two 1000 word articles. The reason we do this is normal sites don’t just have a slew of 500 word articles, so we want to chop and change it a bit and make it look more natural.. If you don’t want to pay for articles to be written, that’s totally cool, you’ll just need to write them yourself. You can skip this step entirely, but remember to write useful engaging content that will satisfy your visitors. I like to suggest titles for all my articles as it gives the writers a good idea about the type of article you are looking for, plus it allows me to choose a headline that is a little bit magnetic. You want to have titles that actually sound a bit interesting, so that if people see your site in the SERPS, they will be tempted to visit you. For the keywords we are using on the example site, I’m going to be requesting articles with the following titles. Go ahead and sign up for iWriter and log into the site. You’ll need to deposit money before you can get articles written, so deposit $41 right away. This is the cost for ‘Premium’ writers. 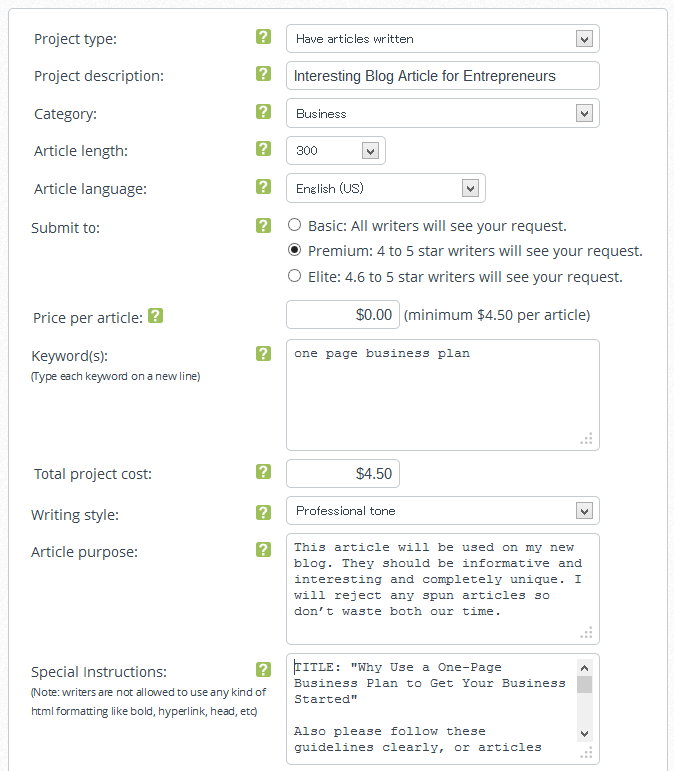 You can make this cheaper by opening your writing tasks up to all writers on the site. You should calculate in advance how much you’ll need to deposit, so you don’t end up with a big balance just sitting in your iWriter account. After you have deposited the money, click ‘Request Articles To Be Written’ on the homepage, this is where we really get the ball rolling. Because we are suggesting a title for each article, we need to fill this form out 6 times, but it won’t take you long. You’ll easily fill in the details, choose Premium Writers, and fill in all the other fields. This article will be used on my new blog. They should be informative and interesting and completely unique. I will reject any spun articles so don’t waste both our time. Also please follow these guidelines clearly, or articles submitted will unfortunately be rejected. – Do not worry about keyword density, write naturally. Many thanks, if you write well I will add you as a favorite writer, so you will get better rates when writing for me next time. You’ll receive emails from iWriter then an article is ready for review. Click the link in the email, and read the article. You can either reject it (where it will be re-written by someone else), have it rewritten by the same guy, or approve it. You can reject articles as much as you want, so don’t worry about not getting an article you like, you can just reject it, or get it rewritten. Once you have requested all six of your articles, sit back and enjoy your morning cup of tea while these are being written and then, we can then move onto the next step. 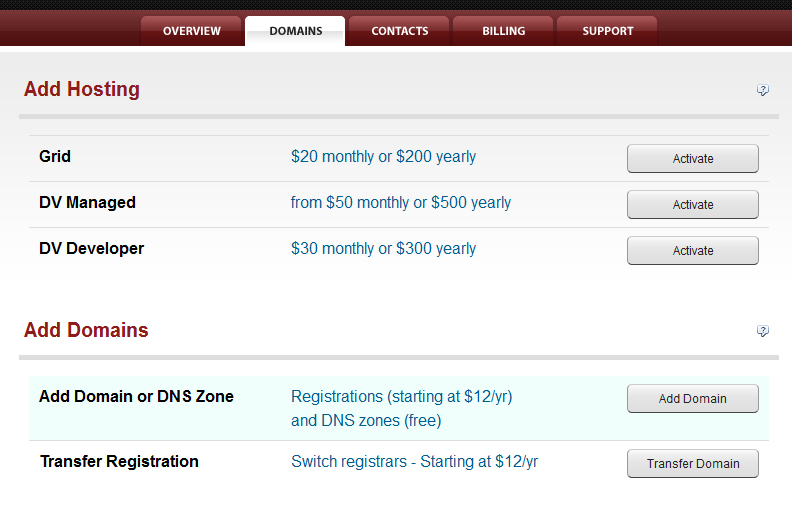 Here you get to spend some more money, and buy a nice cool domain name and some whois privacy. A little retail therapy never hurt anyone eh! If you are just building a personal blog to learn a little about internet marketing or building websites, then it isn’t important to get a domain with existing authority, so you can skip this first step and simply choose any available domain to register. Head on over to Expired Domains and register, then log into the site. We’ll be using an expired domain with an existing back-links profile to give our site a head start. 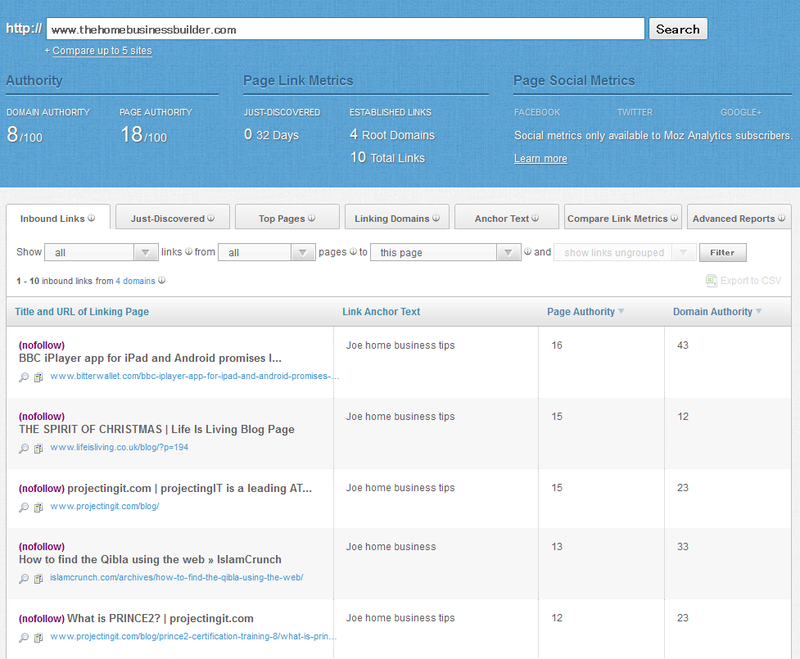 In the First Tab, tick ‘only new last 24 hours’ and specify a minimum of 100 back-links on the ‘min Backlinks’ part. Next click on the second tab (Additional Filters) and tick ‘only available Domains’ as we don’t wanna see domains that aren’t available. With these results, order them by Domain Pop and have a look through the list. If any take your fancy then copy the domain and paste it into the Open Site Explorer search bar. 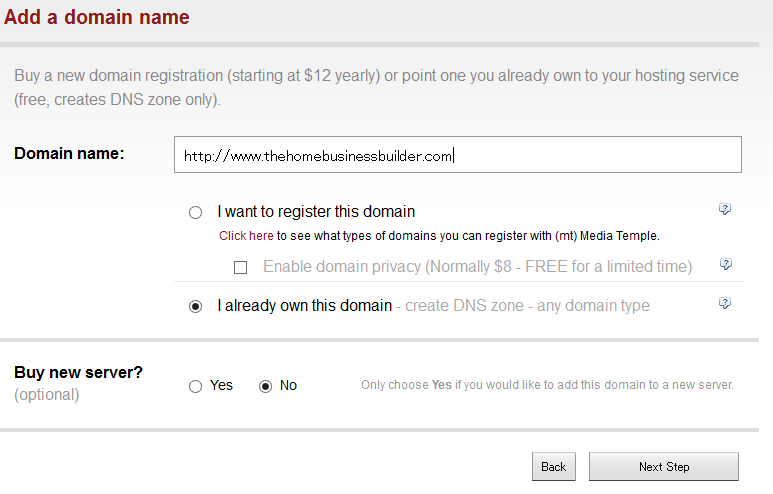 I’m also adding in a constraint that I want my domain to contain the word ‘business’. If you have a specific niche, you might also consider doing this, just as an extra step to ensure your domain is on target. 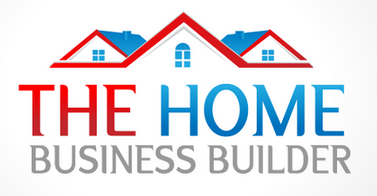 I see that there are a couple of nice business domain listed today, the one I’m particularly interested in is the ‘home business builder’ one – so I’m going to dig in a bit further and make sure it hasn’t got a super bad back-links profile. You’ll want to open up a new tab or window and visit the Open Site Explorer. They will provide you with the Domain Authority (DA) and Page Authority (PA). These are measures by Moz, which are more important than the Google PageRank value. The higher the DA the better. In Open Site Explorer, you are ideally looking for a DA of above 25, but anything around those sort of level would be a nice head start for the site. The site I’m looking at is well below the 25, and its only got 10 back-links to it, so not anything to get excited about, but as this site isn’t for a blog network, it’s not important to have a strong back-link profile, so I’m still happy with this domain. Once you have found an available domain with existing back links, you want to make sure that those back links aren’t going to have given the domain problems. Too many spam links, or links from Russian blog networks is not good, neither are links with pharmaceutical type brand names. Visit ahrefs and again plug the domain into this search bar and pull up some back-link statistics. 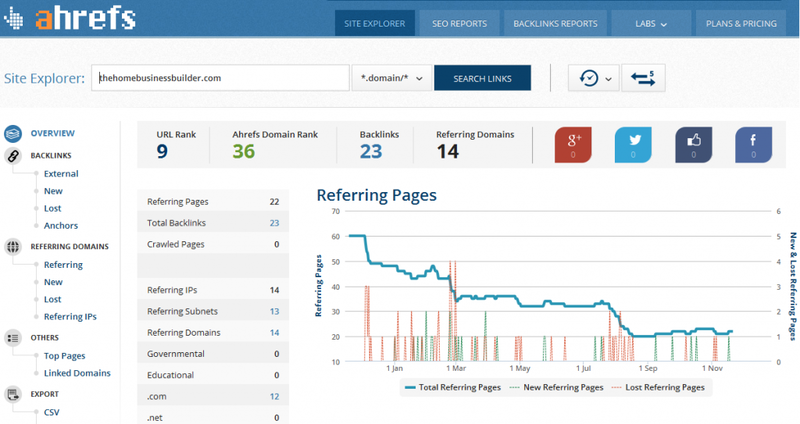 You will ideally be looking for a natural spread of anchor texts and referring domains. Here you can see the profile of this domain in ahrefs, if you scrolled down you’d see all the details about these back-links – yet again, nothing to worry me, so I’m going to register this domain to use as my example site. If you are happy with the back-link profile that point to the domain you are interested in, then it’s time to register your new domain! If you aren’t happy with the look of the back-links, i.e. they are all adult rated, or related to pharmaceuticals, then head on back to the expired domains search results and keep working through them until you find something that is good. If you can’t find anything that will be appropriate then you might have to consider pausing this and coming back in 24 hours, or choosing a brand new domain (of your choosing) and just registering it. I personally always use godaddy for my domains. Yes I know there interface is a little clunky, and yes I know there CEO shot an elephant – but they are keenly priced if you have a few minutes to search for a coupon. Visit godaddy and type in the domain you have found in the previous steps. Sometimes, domains that appear as available aren’t actually available – I know it might be frustrating, but you should then go back and pick another domain name. Add your domain to your cart, and before you finish and pay at the checkout, open another browser and Google godaddy coupon and choose one of the top results. Have a browse through the coupons they offer, and find a good one like “.coms for $1” or something else that offers a saving like that (ideally one that offers .com and domain privacy for 60% off etc). These coupons change almost daily, so I can’t tell you exactly which one is best. When I registered my domain, the coupon I chose gave me a domain and whois privacy for the princely sum of $4.18. Don’t forget to enter the coupon code that you previously found for a nice discount. You can enter multiple coupons and see which one offers the best value for money. Because we aren’t going to be hosting with godaddy, you’ll want to update your name servers. Name servers basically tell visitors what IP address to use when they type in your URL. If you find a coupon for domain and hosting, then you should consider buying it. If you are going to host with GoDaddy then you won’t want to update your name servers. After registering your domain, you’ll see the following screen. 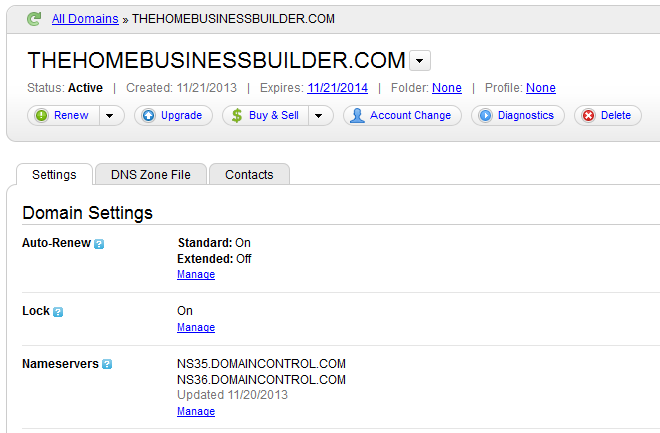 Click on the top button to go to your domains control panel. 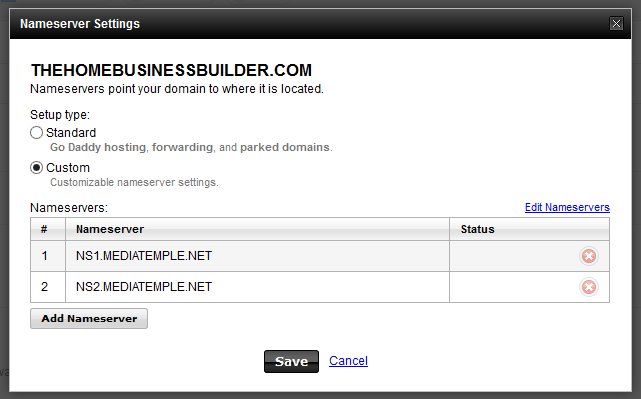 Once in the domains control panel, click on the domain name that you have just registered. If you are following this guide exactly, and using Media Temple (as I recommend) – you’ll want to enter their name servers for your domain. To do that you need to click on the ‘Manage’ link in the name servers section. In place of the XXXX.DOMAINCONTROL.COM ones, so that your screen then looks like this. You’re all set now for this part of the process, the domain is registered and pointing at our hosts name servers. Next step is to get hosting set up. There are a load of great hosts out there, but there are also some stinkers – I would suggest going with a host that is recommended to you personally, and not just picking one at random. My answer for people who ask me what host to use, is always Media Temple. They offer a great service at very reasonable prices, and you get great support included. Yes they are more expensive than ‘budget’ hosts, but you get so much more reliability, security and support for the money, it really is worth the small monthly fee (especially if you need to host more than one site, each account can handle 100 sites). Head over to media temple and sign up for their shared hosting account. It costs $20 a month, but with everything else in life you get what you pay for. You will be getting a solid host that won’t ever give you any problems. Once signed up – log into your media temple account, and on the main page click on the ‘Add Domain’ button, and then click on the new Add Domain button that appears. You will want to enter the details just like I have shown below, except of course using your the domain you have just purchased at GoDaddy and not mine! If you get an error message, just use domain.com without the http://www. part. On the next screen, just tick your Grid Server and click Next – and that is it, the hosting is now set up! Time now for another cup of tea! You will want to wait for the DNS changes to propagate. You can easily tell if this has happened yet, by visiting your new site and pressing shift while you click the refresh button. If you see a GoDaddy holding page, you’re not ready yet. Come back every 15 minutes and hard refresh the webpage and when the DNS changes have all been applied you will see a forbidden error message instead of the GoDaddy landing page. In your media temple dashboard, click on the ‘Admin’ icon and then click on the ‘1 Click Installations’ button, ‘Add New Application’ and then click on the ‘Start’ button next to the WordPress graphic. On the next screen there are a couple of fields where you will need to enter details. Firstly type in your URL (without www) into the box. In the Database Configuration field, choose ‘new…’ and in the box that appears below it, type in a very short word to identify your domain. This can be any letters you want. Finally the Database table prefix: This can be left as default wp_ but for security I ALWAYS add a few random numbers, just to people cannot immediately guess my table names. Next you’ll see a message warning you about a “Directory Conflict” – this is perfectly normal, just click “Backup Content and Proceed“. Now you’ll need to chill out for a few minutes while the installer works its magic. Probably a perfect time for a cup of tea! When you’ve finished your brew, you’ll see the page has refreshed, and you’ll have a little green arrow next to your domain name. 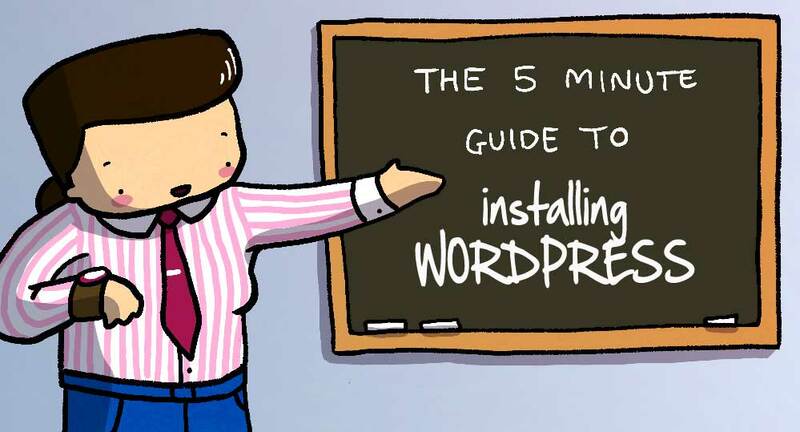 Click ‘Finish’ to complete the installation, and the next step is to set up WordPress. You’ll want to enter the details in the next screen following the on screen instructions, and, if done correctly (it’s pretty hard to screw this step up!) will result in your WordPress install being successful. You should use a strong password for your WordPress install, you can generate them for free here. I’d also suggest you choose an admin account that isn’t called ‘admin’ as it again increases the security of your WordPress installation. Easy eh, and to think some people charge $50 just to install WordPress. 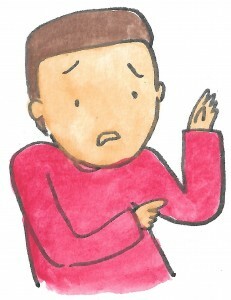 Four articles have now been written, I have rejected one for being rubbish, so still waiting for 4 more to be delivered. 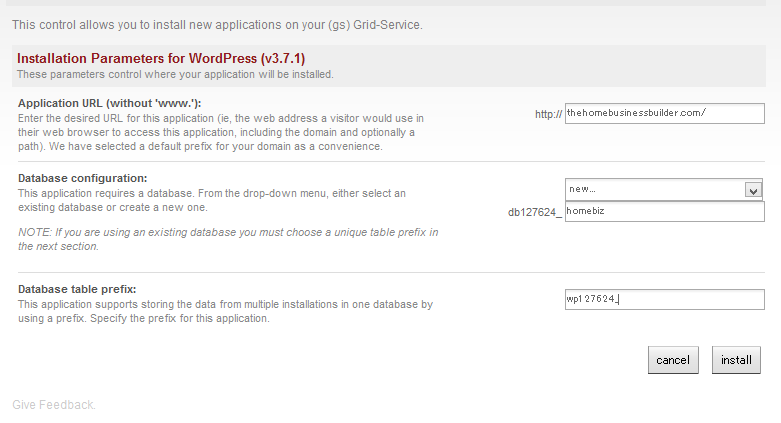 Once you are up and running with your WordPress install you can start getting down to the fun stuff! We’re gonna be installing some nice plugins to help protect us from spam as well as one to help us create a bunch of legal pages easily and quickly. We will be installing the following plugins. To Install the plugin, in your WordPress dashboard, click on ‘Plugins’ then ‘Add New’ and type the plugin name into the search box. Once you see the plugin, click ‘Install Now’ and click ‘OK’ on the dialog box that appears. You’ll see a message saying that the plugin has been successfully installed (yahoo!) so click on the ‘Activate plugin’ to well, activate it. A small housekeeping note, but always delete unused plugins. There is no point leaving them on the server, so just delete them from your Plugins dashboard. I will delete the ‘Hello Dolly’ and ‘Jetpack’ plugins that come pre-installed as I have no need for them. Want to Find Out What I Consider My 12 Essential Plugins? Then you should click the button below, to open my comprehensive guide to all the plugins you will ever want and need installed on your site. Time to make your site pretty! Click on ‘Appearance’ and then ‘Themes’ from the WordPress dashboard menu and then click on the ‘Install Themes’ tab at the top of the page. Either enter a keyword to search, of just click on the ‘Newest’ link at the top of the page to see all the recently added themes. We’re going to browse through the available themes and pick one that seems appropriate to our niche. Don’t forget you can change this theme easily whenever you want, so don’t stress out too much about getting something that is perfect for now. For this tutorial, I’m going to be using the theme Morphic theme as it seems to be a very clean and professional looking theme and is completely responsive, meaning it will render correctly on small devices like tablets, and smartphones. I also personally really like this type of theme, as you can really enhance the simpleness of it with a splash of color or a brilliant image. Because the theme is quite monotonic, a bright logo or call to action really pops. I think that this is a somewhat subjective point, and that the free templates have actually been getting a lot better recently. Take a look at the free themes in your WordPress dashboard, and see if any take your fancy. If none are striking you, then take a look at the ones that theme forest have to offer. You can quickly and easily buy any of them, and set them up according to the extensive documentation that usually comes provided. There are a few things we’ll need to change in the WordPress settings. One of them is Permalinks. By default WordPress uses web URLs which have question marks and lots of numbers in them; however, WordPress offers you the ability to create a custom URL structure for your permalinks and archives. This can improve the aesthetics, usability, and forward-compatibility of your links. In your dashboard, click Settings->Permalinks and select the option that says ‘Post name’ and click the save button. In your WordPress dashboard, click Posts->Categories to load up the categories page. If you were publishing a lot of content you would want to make extensive use of categories. You don’t want to have too many, but you should use them so that a visitor can quickly locate articles of interest. You can read more about Categories and Tags by doing a quick Google search. 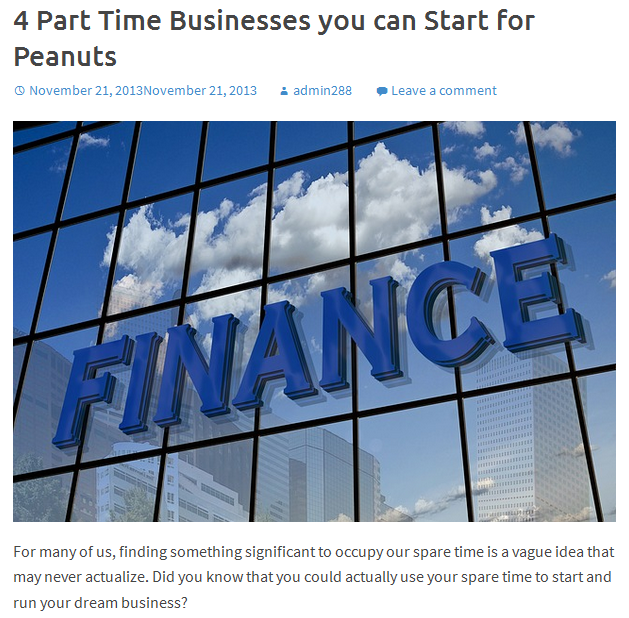 As we are only having a few posts on this site, I will create a single category ‘Business Articles’. I’ll do that by just renaming the ‘Uncategorized’ category that is always set up. You will need to create some standard legal pages for your site. The inclusion of such pages has become a requirement now as many advertisers (clickbank, adsense etc) insist in their terms and conditions that these legal pages are present on your site. Because we are going to use the WP-Insert plugin (that we installed earlier) to create these for us, it saves us a decent amount of time. You don’t need to enter any text in the body of the page, just click on the ‘Publish’ button on the right. Repeat this step, and create the following pages. Once these pages have been created, then it’s time to populate them. 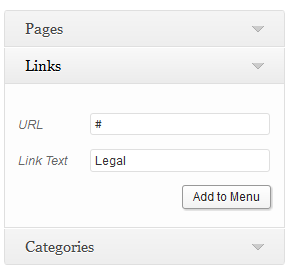 In your dashboard, click WP-Insert->Setup Legal Pages. 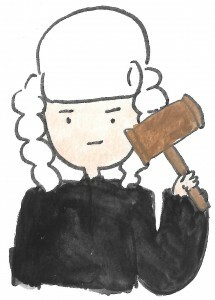 We have now successfully set up all the legal pages with nice content. It’s a common feature on websites to have a contact us page, so we’ll add one too, just in case anyone wants to get in touch. To insert the actual contact form itself, we need to get the shortcode. Right click on the ‘Contact’ menu icon, and choose open in new tab. In this new window you’ll see a contact short code. Copy that, and paste it into your Contact Me page, and click ‘Publish’. You’ll then most likely need to check the contact page to see if it worked. 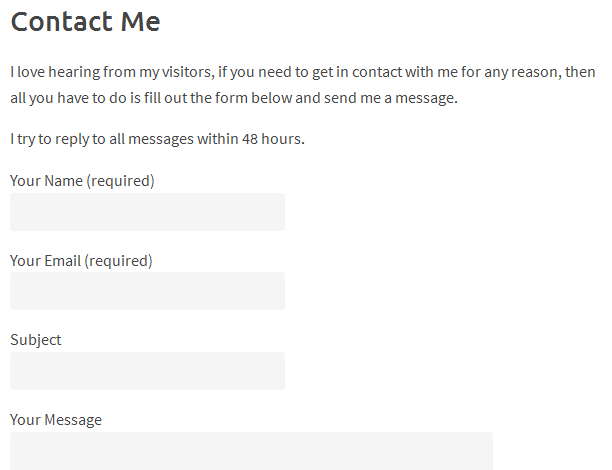 If it did work you will see a contact page with a nice contact form to fill in. 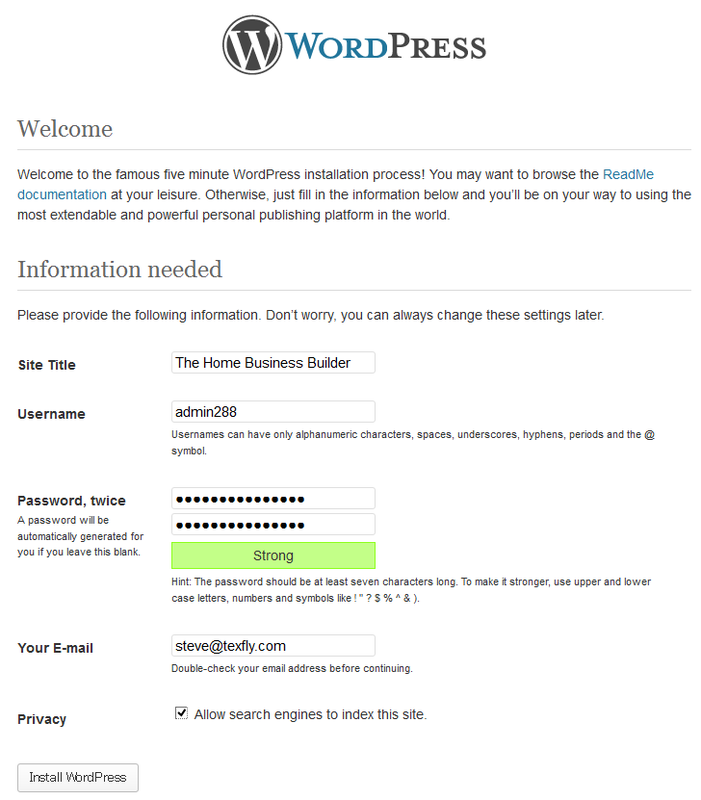 Go ahead and try it, to see that it works – you should receive the email on the address that you set up WordPress with. Here is what my contact me page looks like on the site, yours should actually look very similar. By now our articles should have been written! When you get the emails from iWriter saying that they have been completed, follow the detailed instructions that they provide and either approve or reject the work that has been submitted. Even if you still have a couple being written you can start publishing them now, and adding some graphics to the posts. It will take a little bit of time for each one, so the writers might deliver extra articles while we are working. For simplicity sake I’m going to assume that all your articles are available, and all are wonderfully written and useful (we did choose premium writers remember, and gave them specific instructions) so the next step is to publish them on the blog. In the WordPress control panel, click ‘New->Post’ at the top of the page and then we can enter your articles. Copy and paste the title into the ‘Title’ box. Underneath the ‘Title’ box you will see a Permalink URL appear. You want to make this shorter and a bit snappier. For example the title of this blog post is ‘Step-by-Step Guide to Building a WordPress Site Completely in under 6 hours and for less than $51’ but the URL is ‘/ultimate-wordpress-guide/’. Change yours to something nice as well, and then paste the body of the article into the big box in the middle of the page. Select your articles subheadings and format them with ‘Heading 2’ – You use heading 2 because you only want one Heading 1 (or H1) tag on the page, and your main title will use the ‘H1’ tag. The editor functions similar to Word, if you want to embolden a word, double click it and then click the ‘Bold’ button on the formatting toolbar. When you find your bulleted list, select it completely and click on the bullet button to nicely format it for you. You’ll want to put some appropriate images into your posts. You can get these from a variety of places, including those I have listed here. You want to find royalty free or creative commons images that fit your niche and site, that you can use without any restrictions. The last thing you want is to get some legal action taken against you from one of the big agencies for using an unlicensed copy of a photo that they own the rights to. 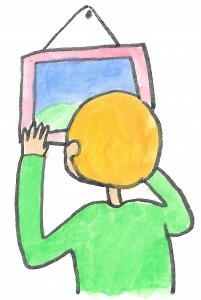 Here are three sites where you can get images for your posts for free. I’m going to spend a few minutes searching these sites, and will hopefully find some really nice big bold images to use with my posts. They don’t need to match exactly, as long as they are somewhat on target with the article topic. Once I have found and saved them locally, I’m going to insert them into my posts in two ways. The first will be as a featured image, which will show up as a thumbnail on the homepage. The second will be as a big bold heading image in the post itself. For each post, go and visit it on your site, and in the top menu bar click ‘Edit Post’. Next, on the right hand side of the Edit Post Page, towards the bottom, you’ll see a link that says ‘Set Featured Image’, click on that and then click on ‘Upload Files’. Choose the image you want off your computer (it will upload automatically) and then click on the ‘Set Featured Image’ button. You’ll see a thumbnail appear on the screen at the bottom right. Now we can insert that same image right into the first line of our post. Click on the text at the top and insert a new line by pressing the ‘Enter’ key. Move the cursor back up to the top, and click on the ‘Add Media’ button. Click on the image you have chosen, and click the ‘Insert Into Post’ button. You will see the beautiful picture then arrive in the post. Click the ‘Update’ button to save your newly upgraded article. The reason we added the picture in two places, is so that the homepage will display a thumbnail, whereas the post itself will show a main image to go with the article. And when the visitor visits an article page, they will see the full image that we have uploaded. Next step is to add a menu to your page, for my site I’m going to add a Legal type menu with all my legal pages under it, a Contact Me button and a list of all my articles. 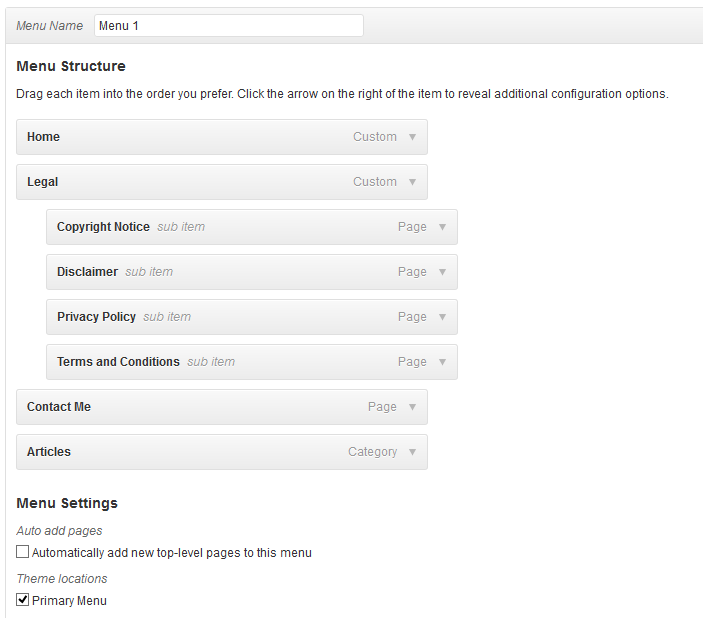 Again in your WordPress dashboard, click Appearance->Menus and we can create your first top menu item, which we will call ‘Legal’. Click on Links, enter the URL as “#” and enter the link text as “Legal”. This won’t be an actual link, but a drop-down header instead. Click Add To Menu. You will see it appear in the box on the right. In this box, we’ll add all our menu items and then literally drag them around until they are in the hierarchy that we are looking for. Next I will click on the Pages tab, and select All my pages (Privacy, Terms and Conditions etc) and “Add To Menu”. Once they are in the main box on the page, I will drag them so they sit, slightly indented underneath the ‘Legal’ menu item that we created a few minutes ago. I will also add my ‘Articles’ category and my ‘Contact’ page to the top level menu and then I will save it. When you save it, yours should look something like this. Click on “Save Menu” and visit your site to see if it has worked as expected. When I check my homepage, I can see the awesome new menu at the top of the page. You can add and remove elements as you see fit, so have a play around with the menu builder. 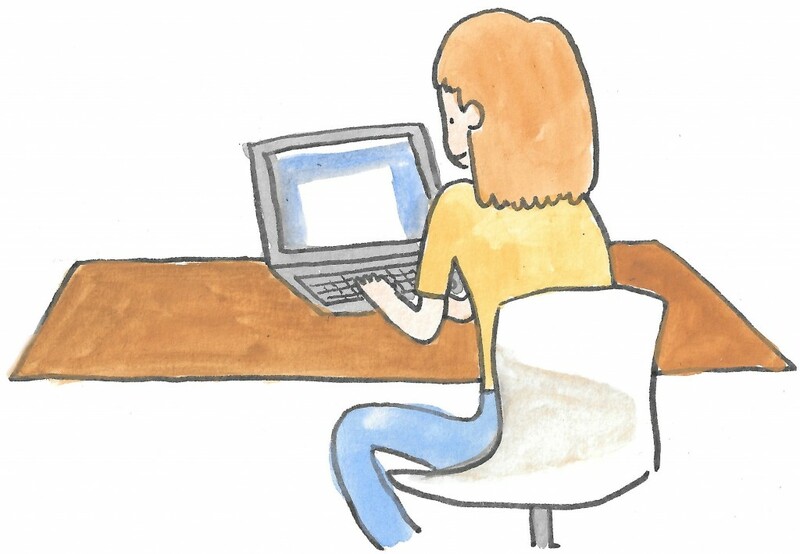 To really put the finishing touches on your blog, it might be a nice idea to have one made. I left this step until last, as you’ll want to show your site and colors to the designer so that they can get you something that fits in well. Head on over to fiverr and do a search for ‘Logo’ and then order the results by ‘Rating’. This ensures that you only see the best logo designers – and should have a fighting chance of getting something nice. Once you have found a designer who’s portfolio you like, request your logo. You’ll need to pay $5 for this, but it’s well worth it in my opinion. These guys like to up-sell speed of completion, so we’re going to have to be patient while this logo is created, but it doesn’t stop the site from being functional – which is perfect for us. In about a weeks time, you’ll have an awesome new logo to upload. Well after a long wait, and seemingly one of the slowest logo designers on Fiverr, I finally got the logo through for the site. It’s actually pretty damned good – for five dollars. Will upload it to the site in a few minutes to give it a really polished and professional look. 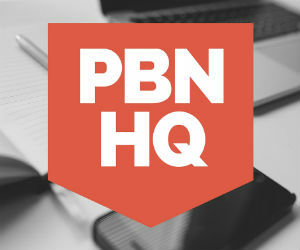 The logo is the one on the right – what do you think?? Worth $5 and a 3 weeks wait?? p.s. Do you like the logo on this site? Look at the top of the screen and you’ll see it. Pretty neat huh? Well that too was designed and delivered for just five bucks. We’ve just ticked over 5 hours from start to finish, which is easily inside the six hours time limit that I set myself. If you’ve been following along, you too should have finished your site! Congratulations! You will have spent just under 51 bucks, and now you have a damn fine looking blog with over 3,600 words of content and some groovy images for each post. You can continue to buy content for your site, or write your own – or you can concentrate on marketing your new site, and building links to it to start getting a bit of traffic. Don’t be afraid of WordPress – you’ve done the very basics here, and have managed to get your site up and running. Try different themes, try adding some new plugins to enhance your site – you’ll be surprised by how user friendly WordPress can be. Don’t be afraid of WordPress, it is very user friendly. Get stuck in and enjoy it! If you get stuck at any stage, please either email me by clicking on the ‘Contact Me’ link at the top of the page, or leave a comment below. Good luck in building your new website and thank you for spending the time to read through this mammoth tutorial. If you want to leave a comment below, please feel free to do so – I will read and respond to every single comment personally, so if you need any help at all, with any of these steps then just shout. Awesome guide! 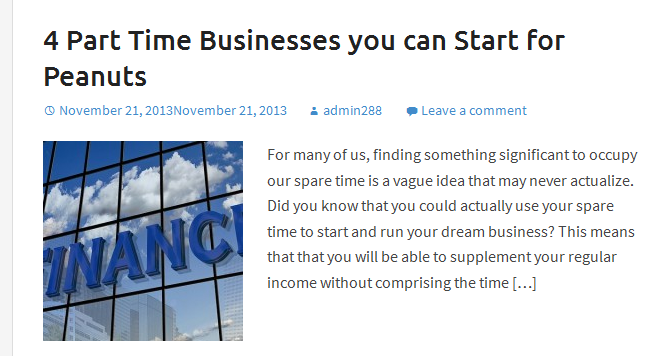 This page really opened my eyes to how easy it is to start a wordpress site. Thanks a lot John, it was nice to chat to you on facebook – really pleased that the guide helped you. The site looks really good by the way, you should be pleased how it turned out! Next step is to keep publishing articles, and maybe add social to your site – twitter, facebook and google plus. Diggin your site. Hit me up sometime. would love to hear more about your long term strategy. Thanks Rob, appreciate you taking time to drop by and say hello! Long term, keep building those niche sites, and am considering a training course of some kind! Hi Steve, what a wonderful tutorial!! It’s easy to grasp and very easy to implement! Thanks Jeremy, really appreciate you taking the time to drop by and comment! I already have a WordPress site, but there was so much awesome stuff in this post that I will implement into my site. Thanks for the quality info man. the article is awesome and it is fully useful for me. 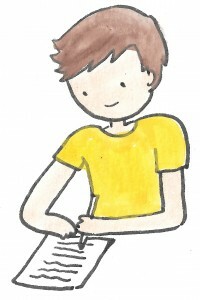 I am wondering why such a great article about starting a blog didn’t get much attraction, (because there is only 7 comments here). But i am glad that i saw this post. Now i know that the process is simple and easy. Everyone is busy reading my PBN article instead! Thanks for the comment Dhinesh! Hi Steve. So glad I happened across your site. 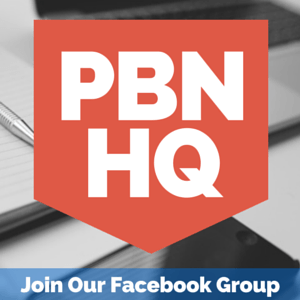 Absolutely packed with real content and actionable ideas. Thanks for a great post. I’m curious to know if you have any thoughts or advice regarding those -1 PR domains? I’d say check em, carefully – in open site explorer. Recently I’ve been using Screaming Frog and a spreadsheet to check for free domains, it seems to be working well.